Was the ancient Greek sage who inscribed those words at the Temple of Apollo at Delphi exhorting us to understand ourselves? It isn’t entirely clear. But it is clear that Socrates, who insisted the unexamined life is not worth living, meant exactly that when he used the same words. But how do we examine our lives? How do we get to know ourselves? The Enneagram is one means to that end. It is an apparently simple, yet rich and complex system that reveals our strengths and weaknesses, our deeper-level motivations, and most importantly, the compulsions that often rule our (unexamined) lives. We move through this world under the impression we’re making authentic choices, but most of the time we’re just blindly following our compulsions, doing the same thing over and over again, expecting a different outcome. We’re living our lives on autopilot; asleep at the wheel. Only after we become aware of our habitual patterns of behavior and responses can we turn the autopilot switch off and freely choose what to do or how to respond. The better we know ourselves, the less likely we are to be ruled by our compulsions. The less we are ruled by our compulsions, the more open and authentic we are. Gaining this depth of personal knowledge and understanding has another benefit, also pointed out by Socrates: it helps us understand other people better, too. In fact, Socrates believed we have to understand ourselves before we can truly understand anyone or anything else. At the simplest level, the Enneagram can be viewed as a personality typing system, but don’t think recognizing and accepting your Enneagram type will strip you of your unique sense of identity or individuality by lumping you together with every other person of the same type. Far from being a narrow one-size-fits-all box, each point has plenty of room for subtleties and variations. Since it doesn’t simply pigeonhole people, but is a comprehensive and multifaceted system, it takes a bit of effort to fully grasp. Numerous books are now available on the Enneagram, written from various perspectives. Below is a very basic overview of the key elements. Enneagram is a Greek word that means nine points. 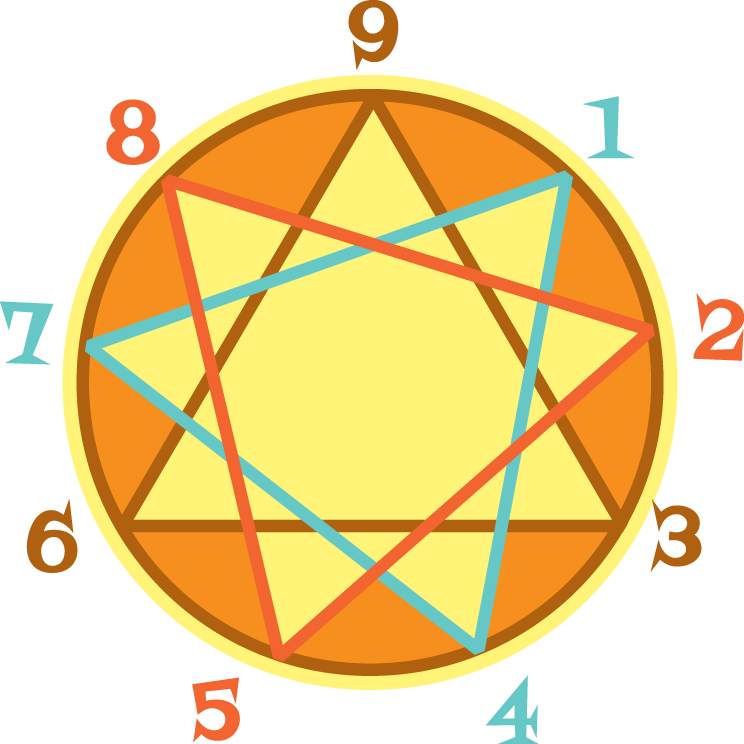 The Enneagram symbol is composed of a triangle and a hexad within a circle. The resulting nine points represent nine basic, or core, personality types, each of which has a unique perspective and approach to life. The theory behind the Enneagram is that we each polarize at one of the nine points. We then overdevelop the characteristics associated with that point, while leaving the characteristics associated with the other points undeveloped. So each point also represents a particular type of imbalance. Our core personality type doesn’t change over the course of a lifetime, but as we become aware of our imbalances, we gain the ability to moderate them. We are no longer ruled by them. 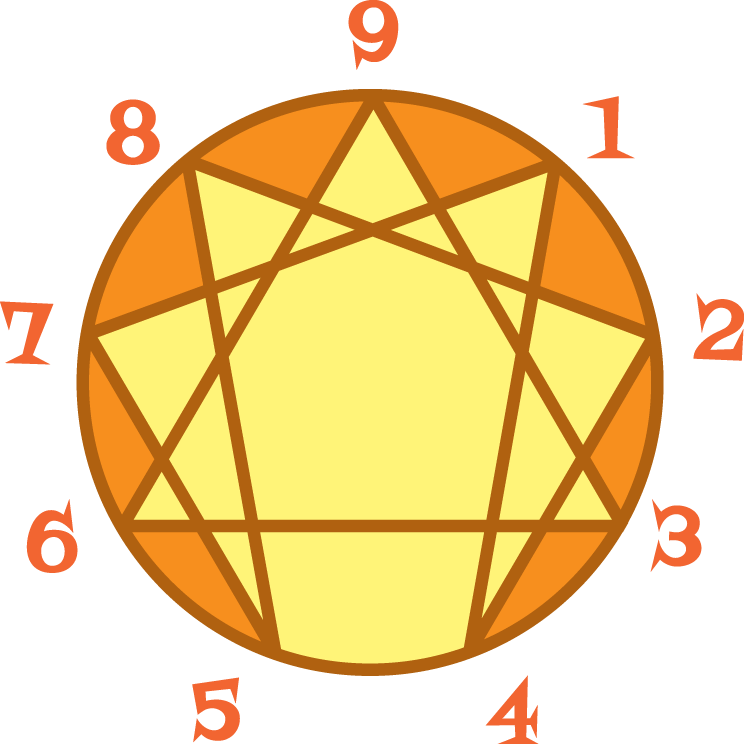 Several important three-part divisions within the Enneagram underlie its structure. The three centers (Doing, Thinking, and Feeling) represent different kinds of intelligence and are sometimes referred to Centers of Intelligence. Of course we all do things, we all think, and we all feel. But we tend to prefer one type of intelligence over the other two. We all know people who are quick to take action, people who are thoughtful “idea” people, and others who are emotionally expressive and empathetic. Each center has a particular issue associated with it, and each of the three types within a center responds to or deals with that issue in a different way. The Doing center—also referred to the Body or Instinctual center—relates to physical/material stability and well-being, self-preservation, vitality, action and reaction. Types 8, 9, and 1 are in the Doing center and share the issue of resistance (anger without a focal point). The Feeling center—also referred to as the Heart or Relational center—relates to emotion/feeling, self-gratification, relationship, sexuality, and empathy. Types 2, 3, and 4 are in the Feeling center and share the issue of image (identity without a focal point). The Thinking center—also referred to as the Head or Intellectual center–relates to personal power, self-definition, logic, rationality, planning, intelligence, and will. Types 5, 6, and 7 are in the Thinking center and share the issue of anxiety (fear without a focal point). Another grouping of threes, called the stances, represents the basic attitude or approach we take toward the world and other people. Our stance is most easily understood in terms of our reaction to perceived threats: fight, flight, or submit. The types that share a stance tend to misuse or under-use the same Center of Intelligence (Doing, Thinking, or Feeling), so they have a lot in common with each other. Fight: The Aggressive Stance, also called “moving against” is taken by types 3, 7, and 8, all of whom either misuse or under-use the Feeling center. Submit: The Compliant Stance, also called “moving toward” or giving in to others is taken by types 1, 2, and 6, all of whom either misuse or under-use the Thinking center. Flight: The Withdrawing Stance, also called “moving away” or keeping to oneself is taken by types 4, 5, and 9, all of whom either misuse or under-use the Doing center. If you’d like to find out what your stance is, you can complete the Stance Keyword Comparison Checklist here. Each point on the Enneagram is connected to two other points, so we are actually triadic beings, and our psyches contain elements of all three types within our triads. Type 2, for example, is actually a 2/5/8. The other triads are 3/6/9 and 1/4/7. Each point within a triad is located in a different center. 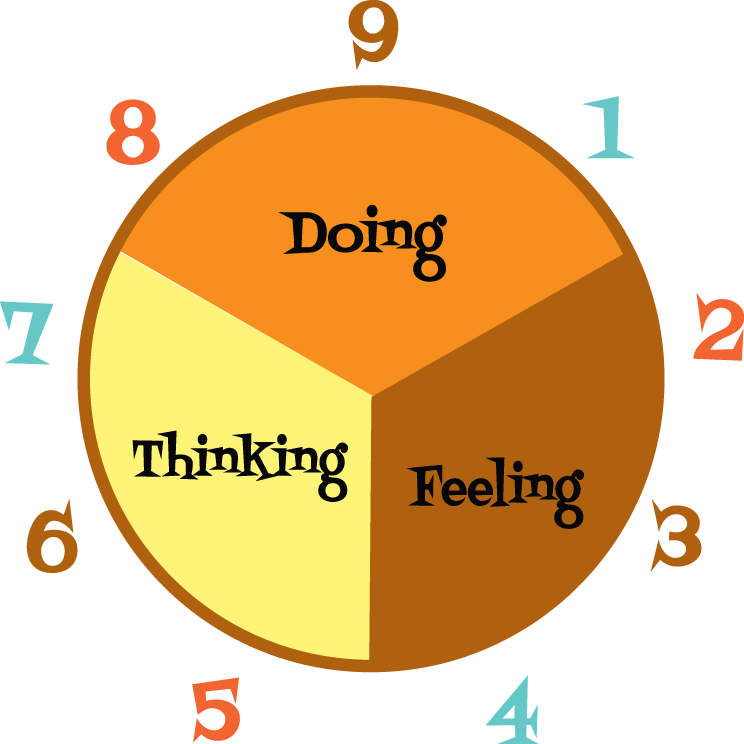 For the 2/5/8 triad, Type 2 is in the Feeling center, Type 5 is in the Thinking center, and Type 8 is in the Doing center. And each point within a triad takes a different stance. Type 2 takes the Compliant stance, Type 5 takes the Withdrawing stance, and Type 8 takes the Aggressive stance. So we have access to all three center and all three stances. In addition, an Enneagram type may have what is called a wing, which means it is strongly influenced by one of the types directly adjacent to it on either side. A Type 2 could have either a 1 wing (represented as 2w1) or a 3 wing (represented as 2w3). Or it could be a straight-up Type 2 with no wing. Imagine the circle of the Enneagram as a dial you can turn to line up with a stationary arrow. You could line up the dial directly at 2, or you could line it up several degrees in either direction. The closer you move the dial toward 1, for example, the more influence Type 1 will have on the 2. The core personality is still 2, but seasoned with a dose of 1. Enneagram type certainly isn’t the only factor that determines what we do, think, and feel. Our own life experiences, among other things, influence how we see the world and how we understand and relate to it. But the Enneagram provides a clear and powerful lens into the workings of our psyches. It doesn’t stop there, however. It actually shows us a way out of our personal gridlock. While it isn’t magic and won’t take us anywhere all by itself, it lays out a roadmap with a starting point and some targets to aim for. It hands us a compass and sends us off to explore and get to know ourselves and to expand our horizons. Since all of us live with, love, and are connected to many other people, it’s important to gain an understanding of all the types, not just our own. Unlike many other typology systems, the Enneagram takes account of both the parts (each of us)—which are represented by the points—and the whole (all of us)—which is represented by the circle. It helps us understand the ways in which we are similar to each other, as well as the ways in which we differ. The origins of the Enneagram are uncertain, but it is hundreds, possibly thousands, of years old. It was brought to the West in the early 1900s by Armenian mystic George I. Gurdjieff and has been used to describe numerous processes (natural and manmade). Some who have studied it claim it can explain all processes. Its current use as a psycho-spiritual tool can be traced to Oscar Ichazo (founder of the Arica Institute in Chile), Claudio Naranjo (a Chilean-born psychiatrist), and their followers. In spite of its esoteric origins and the depth and breadth of the system, it has proven practical value. Even at the most basic level, it can help deepen our understanding of ourselves and our relationships with each other, with the work we do, and with the world in which we live. Pingback: Curiouser and Curiouser | Farther to Go! Pingback: A Shortcut to Self-Awareness | Farther to Go! Fantastic article! I learned a heck of a lot. Thank you!